In the hit series House of Cards, cutthroat politician Francis Underwood (Kevin Spacey) makes sure he’s always at least one move ahead of his colleagues. As the show makes its return to Netflix for a fourth season, we’ve rounded up some little-known facts about the groundbreaking series that even Frank might be surprised to learn. 1. IT’S BASED ON A BRITISH MINISERIES. As original as it may seem, House of Cards is actually based on a 1990 BBC miniseries of the same name. The four-episode series, which was adapted from a novel by Michael Dobbs, took place in the time period following Margaret Thatcher’s tenure as Prime Minister. 2. MICHAEL DOBBS KNOWS OF WHAT HE SPEAKS. House of Cards author Michael Dobbs didn’t have to do a ton of research for his novel-turned-miniseries-turned-Netflix series. In addition to being a writer, Dobbs served as Thatcher’s chief of staff from 1986 to 1987 and the deputy chairman of the Conservative Party from 1994 to 1995. 3. BEAU WILLIMON IS NO SLOUCH EITHER. House of Cards creator Beau Willimon (who won't be returning as showrunner for the 2017 season) is no stranger to the inner-workings of our own nation’s capital. His resume includes stints working for a range of well-known political figures, including Charles Schumer, Hillary Clinton, and Howard Dean. 4. WILLIMON RECRUITED SOME ADDITIONAL HELP, TOO. In order to help get the tone and political maneuvering just right—or, as he told Town & Country, “to make sure we didn't completely embarrass ourselves”—Willimon recruited his college buddy Jay Carson, a political advisor and strategist who has worked with Michael Bloomberg, Howard Dean, and Hillary and Bill Clinton, as the series’ political consultant. Carson also inspired Stephen Meyers, Ryan Gosling’s character in George Clooney’s The Ides of March, which Willimon wrote. 5. HOUSE OF CARDS MARKS DAVID FINCHER’S SMALL-SCREEN DEBUT. Though two-time Oscar nominee David Fincher is best known for his work on the big screen with movies like Se7en, Fight Club, Zodiac, The Social Network, and Gone Girl, he made the leap to the small screen for the first time with House of Cards, which he executive produces. Fincher also directed the series’ first two episodes. 6. THE SERIES LAUNCHED A BIDDING WAR. In 2013, House of Cards made history when it became the first online series to win an Emmy—three of them, actually: for Outstanding Directing (for Fincher), Outstanding Cinematography (for Eigil Bryld), and Outstanding Casting (for casting directors Laray Mayfield and Julie Schubert). A string of additional award nominations and wins, including Golden Globes for Kevin Spacey and Robin Wright, followed and opened up the door for other online-only series like Amazon’s Transparent, which won Golden Globe Awards for Best Television Series and Best Actor (for Jeffrey Tambor) in 2015. 9. KEVIN SPACEY TURNED WOODY ALLEN ONTO NETFLIX. 10. FINCHER ENLISTED AN ALL-STAR GROUP OF DIRECTORS FOR THE SERIES. After setting the tone by directing the first two episodes himself, Fincher turned the directorial reins over to a small group of highly-acclaimed directors, including James Foley (Glengarry Glen Ross, At Close Range), Carl Franklin (Devil in a Blue Dress, Out of Time), Joel Schumacher (Batman Forever, Phone Booth), Agnieszka Holland (Europa Europa, The Secret Garden), and Jodie Foster (Little Man Tate, The Beaver). “I felt like we were telling 13 stories that are all part of one big story, and I was handing off movements to people whose work I admire,” Fincher told DGA Quarterly of the show’s first season. 11. KEVIN SPACEY DID HIS HOMEWORK. 12. MOST OF THE SHOW IS SHOT IN MARYLAND. 13. MOVING THE CAMERA IS FROWNED UPON. 14. FINCHER TOLD THE CAST NOT TO F*** IT UP! 15. RACHEL POSNER WASN’T SUPPOSED TO BE A REGULAR CHARACTER. 16. PRESIDENT WALKER AND SECRETARY OF STATE DURANT ARE MARRIED. 17. WILLIMON'S LOVE FOR THE WIRE IS ON FULL DISPLAY. 18. CASHEW IS ACTUALLY THREE GUINEA PIGS. There’s no doubt that the breakout star of House of Cards’ second season was Cashew, the meme-tastic guinea pig BFF of hacker Gavin (Jimmi Simpson). The role is actually played by a trio of guinea pigs—Oscar, Lucas, and Encore—though trainer Carol Rosen told Vulture that it was Oscar who was used for about 90 percent of the scenes. 19. CHINA LOVES FRANK UNDERWOOD. 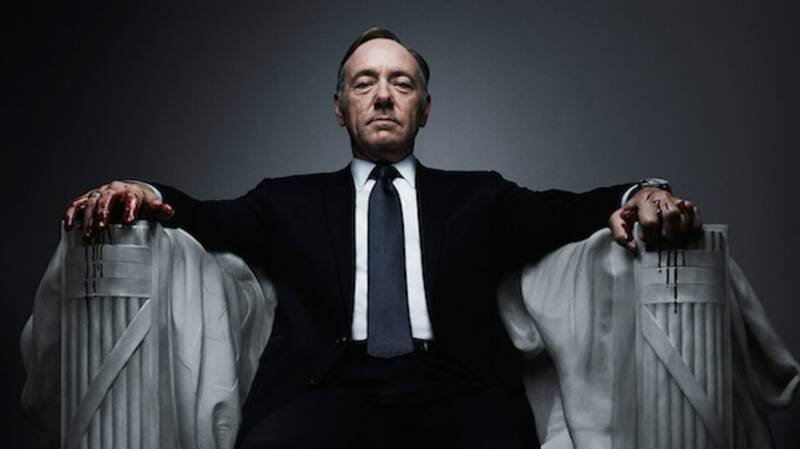 House of Cards has found an enormous audience in China, where it streams on Sohu, the Chinese equivalent of Netflix. In 2014, the company reported that, of the 24.5 million people who watched House of Cards, the majority of them were government employees. Wang Qishan, one of the Communist Party of China’s most powerful leaders, is reportedly one of the series’ most ardent fans. 20. PRESIDENT OBAMA HATES HOUSE OF CARDS SPOILERS! 21. ONE OF FRANK UNDERWOOD’S MOST ICONIC LINES WAS QUOTING FINCHER. 22. UNDERWOOD’S PORTRAIT IS HANGING IN THE NATIONAL PORTRAIT GALLERY. At the premiere of House of Cards’ new season last month, the National Portrait Gallery in Washington D.C. unveiled its latest acquisition, a portrait of Frank Underwood, which will hang alongside its collection of presidential portraits through October.